Today I sold my car. Kind of. I have it still for another few weeks until I actually drop it to the buyer so I can get to and from work until my last shift on May 23rd, but I’ve accepted the offer and taken half of the price with the other half due on delivery. But my trusty white Toyota Corolla Wagon is coming to it’s end of my ownership. My car as it was in May 2014. It’s hard not to be connected to your car when you’ve owned it for some time. I purchased the car back in March 2007 and in the past 7 or so years I’ve done over 150,000km and it’s never given me any mechanical issues. The only problems I’ve had come down to the usual wear and tear; batteries, tires, belts, etc. The car was built from standard shipped in parts but not overseas like most cars on our roads, instead it was one of the NZ built cars, something they stopped making in 1998. My car was made and put on the road in December of 1995. The ownership history is an interesting mix of being used for a government department, a rental car agency briefly, and several private owners. The car was well serviced when I got it and I’ve tried to make sure it’s been well kept as much as I could. With it I’ve driven around the country at least twice in most places. In the past year with having to drive much further to work than before I’ve been racking up around 700km a week on average, with a total of around 37,000 in just the past 12 months alone. A total added to easily by two road trips also undertaken at the time. By the time I hand it over the car will be at over 330,000km in total. I can only wonder what it’s future will be but I’m sure it’ll continue to be just as reliable as it has been for me. Posted in Cars, Travel. 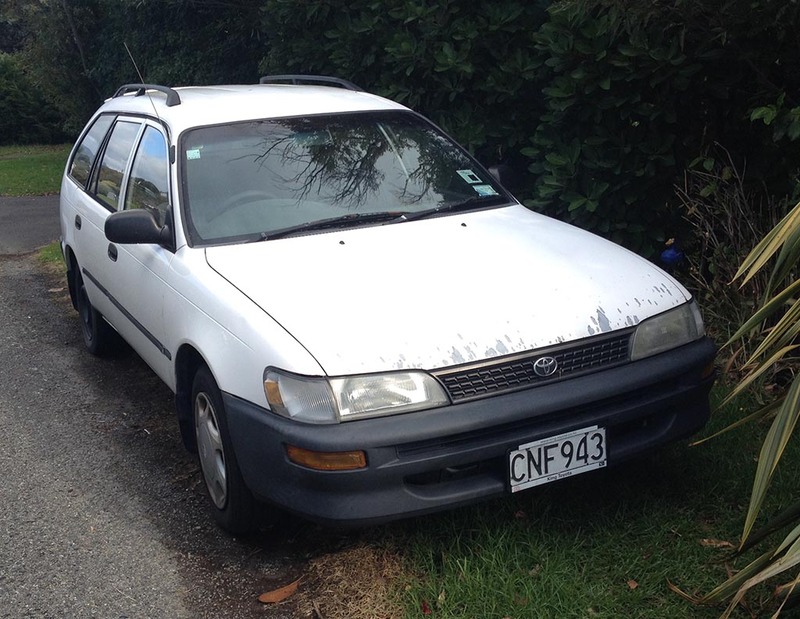 Tagged car, corolla, km, new zealand, road, sale, toyota, travel, wagon.